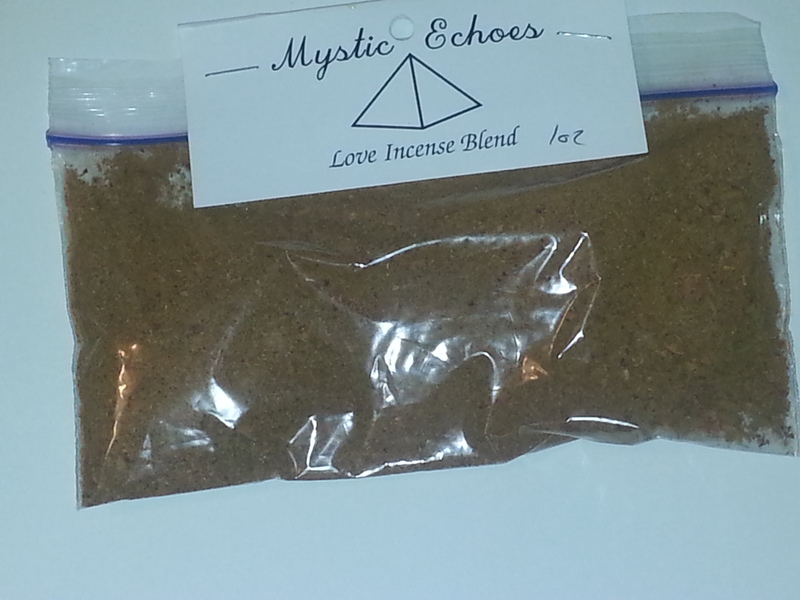 The Love incense blend is spicy and romantic to bring flames to your love life.This is an herbal blend to bring love in our life. If you are in a long term relationship and feel you need a boost this will help. It will remind you of what you love about the other person and bring you two back together. If you are looking for love this is an incense that will bring you love in some form. This incense is a blend of Lavender, Cinnamon, Nutmeg, Rose. Each of these herbs have an association with passion and desire. They have association with romance and intimacy as well as love and delight. These herbs work together to ignite the hearts fire and passion to bring love to a person or to reignite passion between two long term lovers. Lavender is an herb that represents peace and calm as well as happiness. Love is one component in happiness. This herb works in this love blend to bring you a partner you will be happy to be with for a while. Some one that will be your friend as well as a sexual lover and some one who will ignite romantic passion. If you are with some one this herb will reconnect your friendship and the happiness that the two of you share bringing your bond closer together. Roses are one of the most powerful symbols of love out there. Rose colors being sent to loved ones can say what sort of relationship a person has with their loved one. Red roses are for romantic love and pink typically for friends. Yellow is someone you admire. Red roses though are a universal symbol of all love. For this reason red rose petals were used in this incense blend. Cinnamon is an herb that is powerful in igniting passion. It is also an herb that often brings back memories of holidays and family gatherings. Family love is one of the reason this herb was chosen to bring love into a person’s life. Family love is unconditional and is a source of much strength in a person’s life. Nutmeg is another herb that is associated with the holidays and families. This is also another herb for igniting passion. This is a fire herb and will bring emotions to a head. In regards to love it opens the heart and will ignite the spark with a new person. In a couple this herb will bring the passion back and bring spice into the life. This herb is also exotic which brings back passion and spices up the romance within the heart.